How can I get a demo of Antiques SOS? We can provide a demo to you electronically by email, or physically by mail. Please have an email or mailing address provided. We’re glad to answer any questions you have about our products! How long will it take to receive the demo? If you choose to receive the demo via email, you will receive it shortly after the inquiry email or phone call is received. If you choose to have the demo mailed to you, it is typically shipped by First Class mail, which typically rages from 2-3 business days depending on where you are located and when the inquiry is received. The demo is shipped from Washington, Michigan. What is included in the Demo? What are the hardware requirements to run the demo? 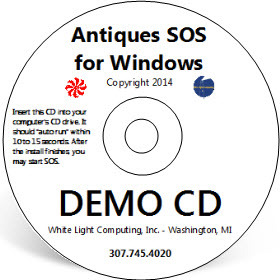 SOS will run on any version of the Windows 7, Windows 8/8.1, or Windows 10 operating system computers, and also on XP computers or even Vista computers (for XP and Vista we recommend 1 GB of memory or more). You can use a laser printer for your customer receipts or you can purchase an additional “receipt” type printer (using 3” tape). We sell Star receipt printers for $225 each and cash drawers for $245 each. When trying the demo, be sure your screen resolution is set no lower than 1024×768 BEFORE you install the CD. That’s a “medium” resolution. To place an order, call 888-527-2643. We turn an order around very promptly when you’re ready. We usually try to get your order in the mail the same day or at the latest the next business day. We do offer 2-day shipping and next day shipping at additional cost. For your convenience, we accept payment by check, Visa, MasterCard, or Discover. View our payment terms. We provide excellent support via email, phone, and fax all over the US.